There can be few documentary film works as important, as widely debated and yet as little seen today as Robert Flaherty's 1922 Nanook of the North. If you have studied documentary at an academic level then there is little doubt you will be at the very least aware of it and may well have watched it, but if not there is a good chance that it's little more than a title in a weighty tome on cinema, a film so engrained in cultural history that it has become everything from an ethnological put-down to a post-modernist reference. Yet it never turns up on TV and you won't find it down the local video store. Indeed, the disc under review here is an American import from a company that specialises in restoring classic films for DVD. There are two factors at work here, despite the film's status: those of age and genre. Even with the explosion of popularity that has blessed the DVD medium in the past few years, few distributors have been prepared to go back into the 1920s and commit money and resources to putting out a film whose sales potential is inevitably limited. On top of that it's a feature-length documentary, and until the recent post-Bowling for Columbine revival in popularity of the genre, this was regarded as a largely unmarketable area, at least for DVD. But Criterion, a company dear to the hearts of all true film fans, have never been on a popularity kick and have always actively sought out important or overlooked films for home video release. To emphasise the point, Nanook of the North was one of their earlier DVD releases and has been available for over six years now, longer than many of us have had DVD players. Robert Flaherty is, without question, one of the most important and influential figures in documentary film history. The documentary format has been in existence since the birth of cinema and even found popularity with a mass audience: the early 'Actualities' provided glimpses into the working lives of ordinary people and industrial processes; major events were recorded by the likes of Thomas Edison; and voyages of exploration were filmed in captivating detail by the likes of Herbert Ponting. Nanook of the North, Flaherty's first film, was nonetheless something new, a study of an Inuit (or Eskimo) family that fully engaged with its characters, that was presented with humour and insight, had sequences that were genuinely exciting, and had a clear and structured narrative. To a 1920s audience this must have been revolutionary, providing a window into a society that was radically different from anything in their own experience in a world with no television or internet or even glossy magazines. The average audience of the time would be seeing something here that they had simply never encountered before, presented in a way that was as enthralling as any contemporary fiction film. Over eighty years later, Nanook and his family remain engaging on-screen characters, and despite the advancement in cinematic techniques and global availability of detailed information on pretty much every culture and lifestyle (including the first ever Inuit feature film, Attanarjuat: The Fast Runner), Nanook still stands as an involving historical document, one whose role in the development of the documentary format has its own particular fascination. Indeed, the film was made before the term 'documentary' had even been applied to cinematic works – that happened in the 1930s when John Grierson, speaking of the 1926 Moana, observed that the film, "being a visual account of the events in the daily life of a Polynesian youth and his family, has documentary value." It seems only appropriate that Moana was directed by Robert J. Flaherty. It was only some years after Nanook was first shown that the debate surrounding the film – and Flaherty's work in general – took a more controversial turn when it was revealed that although Flaherty had lived with Nanook and his family and followed their daily lives with his camera, key scenes had been effectively staged for the camera. Flaherty's documentation, it turned out, had been manipulated to produce not an accurate picture of contemporary Inuit life but a romanticised version of how they used to live. Thus all traces of western clothing and buildings – both of which were by then then commonly used by the Inuit people – were deliberately hidden, outboard motors were removed from Kayaks and replaced by paddles, and Nanook's family turned out not to be his family at all but carefully selected by Flaherty for their photogenic qualities and paid a wage to play their parts. Perhaps most controversial of all was that one of the film's most memorable scenes, a semi-comic tug-of-war in which Nanook very physiclaly battles to land a harpooned seal, was completely faked, with the rope Nanook is holding onto being pulled by a group of his friends located just off-camera, an already dead seal used for the sequence finale. It has even been suggested that Flaherty, by insisting that the Inuit use harpoons instead of the by-then commonly used rifle, endangered the lives of his subjects during a hunting sequence. There is no doubt that this knowledge effects how you view the film. The aforementioned seal landing, for example, combines comedy and tension in a way that is endearing, but knowing how it was really done adds a level of fakery to the sequence that disconnects you from the activity and switches attention to the performance, as athletic and audience-aware as one by any silent film comedian. But this manipulation of the subject, this staging of some elements, does not invalidate the film in any way. Flaherty's original intention was not to make a documentary at all but a film targeted at commercial distribution to a mass audience, with the story devised on location by Flaherty and his cast, who even attented daily screenings of the rushes. The film still has an essential and compelling truth to it, and there are some very real and revelatory moments that even to this day seem fresh and fascinating: the rapid and skillful construction of an igloo, complete with ice window; the kayak that arrives at the trading post with what looks like just two people on board but in fact contains Nanook's whole family stowed away like cargo; Nanook's almost casual hopping across an ice flow; the small details of family life inside the igloo. 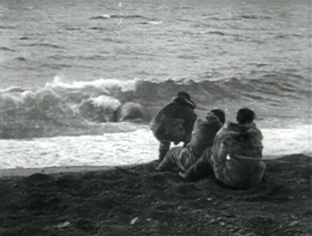 Other sequences, including the famous walrus hunt, are shot and cut with real pace and urgency. Elements may well have been staged, but this is absolutely in line with how the documentary feature has developed in more recent times, with one eye on the subject and the other on holding audience attention. If you thought the idea of making documentaries entertaining as well as informative was a relatively modern development then think again. Indeed, Flaherty's real triumph is in recognising that the documentary, a film form that as yet had no name and thus no real conventions, could be more than just a sober record of the facts and could entertain as well as inform, something Nanook of the North can still do eighty-three years after it was first released to such wide acclaim. It remains above all else a humanist film, if one tinged with nostalgia for a way of life that was already vanishing. It is perhaps ironic that John Grierson, the man who first gave name to the genre as a result of watching one of Flaherty's works, was the one who later led the criticism of the director for romanticising his subjects at the expense of reality. By then Grierson was proving the inspiration for a whole new generation of documentary film-makers who, through the movement that came to be known as Cinéma Vérité, put truth to the forefront, following their subjects without interference and creating the story in the editing room. The documentary form as we know it today has drawn from both of these sources, and entertainment has become a key aspect of even political documentary works, a way of providing an audience raised on fiction films with stories and characters they can engage with and a clear narrative structure for them to follow. That the 1922 Nanook of the North was already doing this cannot help but give the film, despite its age, a surprisingly modern edge. In a tragic postscript, Nanook himself, whose real name was Allariallak, died of starvation while out on a hunt a few months after the film was released. OK, this is a silent film made in 1922 and thus it is inevitably not in perfect condition. There is a fair amount of dirt and scratches, some occasional (but very minor) frame jitter and exposure flicker, none of which should come as anything of a surprise for a film of this age. That aside, Criterion has once again done a decent job on the transfer, with contrast and detail often better than expected. Some scenes have been very nicely cleaned up, with dirt and damage down to almost nil, which given the amount of snow in many scenes is particularly pleasing. This is a new print struck from a fine-grain master positive from a 35mm restoration negative, and is likely to be as good as the film has ever looked. The film speed has also been adjusted to match the original projection speed of 21.5 frames per second, rending movements at a more natural (though still very slightly accelerated) speed. A new score was written and recorded in 1998 by silent film specialist Timothy Brock and very effectively compliments the film without resorting to obvious Mickey Mousing (the exact matching of music to action in the manner of a cartoon). This score is reproduced in stereo and is a clear and unflashy mix, appropriate to the age of the film. An early Criterion DVD, this has only two extras. A short extract from the TV documentary Flaherty and Film (8:43) has Flaherty's widow and Nanook's co-editor Frances interviewed by Robert Gardner, director of the Film Study Centre at Harvard from 1957 to 1997 and a film-maker of some note himself who has twice won, yes, the Robert J. Flaherty Award for Best Nonfiction Film. Made some years ago (no exact date is supplied), the presentation is primitive and somewhat artificial – there is none of the relaxed chat of modern interview television, and Frances almost looks as if she is reading from a card at times. But this is a rare and valuable inclusion, with Flaherty described as "an explorer first and a film-maker a long way after" and very useful insight provided into his approach to the project and intentions for the film. Still Photo Gallery is a collection of photographs taken by Robert and Frances Flaherty of the Arctic frontier, the Inuit people they encountered and befriended (including formal portraits) and the process of making the film, including the picture used on the DVD cover. Though not reproduced full screen, they are of reasonable size and numerous in quantity. 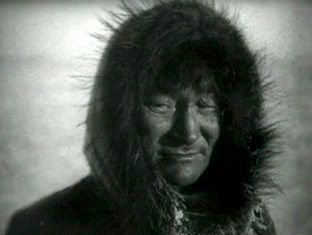 It would not be overstating the case to claim that Nanook of the North was the father of the documentary feature – it was certainly one of the first such films to engage the audience so effectively with its characters, to have such a solid narrative structure, and to entertain as well as inform. That some of the sequences were staged remains a point of debate and argument, but this was made almost forty years before the guiding principals of Cinéma Vérité put truth above all else and some years before the term documentary was even coined. That we have come full circle in recent years and seen a string of documentary features that have successfully melded truth with showmanship only helps to re-enforce just how important and successful a film Nanook of the North remains to this day. Above all else it is still a hugely enjoyable and involving portrait of a way of life that was already changing and has now long since given way to outside influence. For those still troubled by Flaherty's staging of key events, I recommend the opening five minutes of John Sayles' 1983 Lianna, in which a film lecturer smartly demonstrates how all documentary film is essentially a manipulated version of the truth. For everyone else, see the film, appreciate just what Flaherty achieved, and celebrate his cinematic legacy.